We have seen recently how involved Nancy Dora Dinnis was during WWII serving with the A.T.S. [Auxiliary Territorial Service] 93rd Searchlight Regiment. They became very close friends, and reunited some thirty years later to look back at their shared experiences. 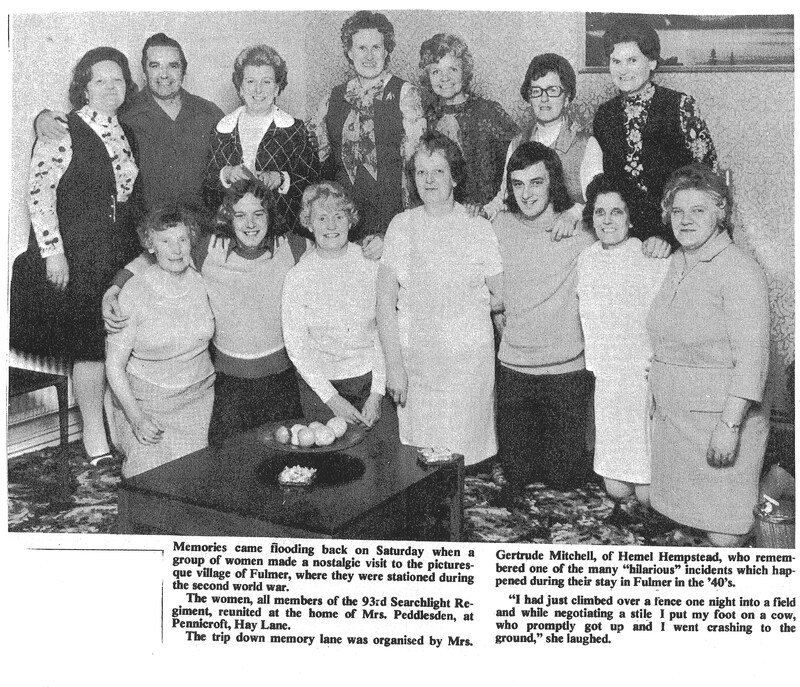 Here are a couple of newspaper clippings regarding the reunion. During the last war a dozen teenagers joked that they would re-unite 30 years later and laugh about the experiences which didn’t seem so funny at the time. And on Saturday they are going to do just that in Hemel Hempstead. The 12 former Auxiliary Territorial Service (ATS) girls are now almost 50 and have kept in touch each Christmas. One is travelling from Miami in America and is bringing all her letters through the years with her. The reunion will be at the home of Mrs Gertrude Mitchell, at Lonsdale, Highfield, Hemel Hempstead. They had hoped to arrange it exactly 30 years later but the one from America couldn’t make it until this year so it was postponed. They will have a meal at Mrs Mitchell’s home before travelling to their wartime post at Chalfont St Peter. They were stationed in the searchlight installation there and believe that it is now a grazing field. “We should have a good laugh and it will be wonderful to see everyone again,” said Mrs Mitchell. Memories came flooding back on Saturday when a group of women made a nostalgic visit to the picturesque village of Fulmer, where they were stationed during the second world war. The women, all members of the 93rd Searchlight Regiment, reunited at the home of Mrs Peddlesden, at Pennicroft, Hay Lane. The trip down memory lane was organised by Mrs Gertrude Mitchell, of Hemel Hempstead, who remembered one of the many “hilarious” incidents which happened during their stay in Fulmer in the ’40’s. “I had just climbed over a fence one night into a field and while negotiating a stile I put my foot on a cow, who promptly got up and I went crashing to the ground,” she laughed. Ten years later Gertrude Mitchell wrote a poem for their 40th anniversary on the 1st of May 1982, entitled ‘Forty Years On’. From London and from Lancashire, our sergeant came from Wales. We even had a fur coat to keep us warm at night. To a site near Chalfont, along a lonely lane. We had to use a bucket to have our daily baths. You should have seen the plague of wasps that came when it was hot. We often gathered mushrooms before the morning light. Upon our duty R.T. set, the enemy were near. Quite often we ‘homed’ damaged planes by putting up our light. We had our disagreements as all large families do. To ‘JORDANS’ and our memories, the best there’ll ever be. This entry was posted in Nancy Dora Dinnis, World War 2 and tagged ATS, Auxiliary Territorial Service, Reunion, Searchlight Regiment. Bookmark the permalink.